Penicuik hosted games with DAFS CC and Partick CC on Friday evening (18 Jan). Friday 18th of February was the third challenge between our two clubs. This year it was a home game for us. 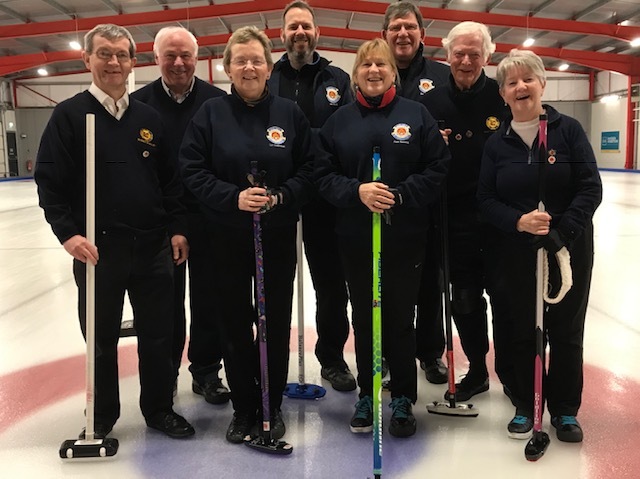 A friendly game, Iain Scott, Liz Anderson, Pam and Jim Ramsay rotated position every two ends as did our new friends Robbie, Duncan, Geoff and May from Partick. End 1 was taken against ‘The Hammer’ with a single. End 2, we were on the board with a two. End 3 with Iain in the head, we thought we were on for a 4 or 5 until Duncan drew in to cut us to a one. End 4 saw us gain a further 2 after our Skip guarded well. Liz took over as Skip in the 5th end where we lost a 2. We still don’t know what Liz was up to half way through the 6th end. She and Geoff decided to inspect the base of one of the stones in play, in the house. When play resumed, we were able to claim a three. End 7 and the last end, Pamela was able to claim a 3 after Partick managed to clear their stones from the house. Despite the 2 – 11 score, we are sure that the Partick team enjoyed their time with us. Penicuik started well with a creditable 3 in the first end and were looking good to steal a good score in the second until, having failed to provide a good guard, DAFS skip Graham played a good hit and roll for a single. Penicuik increased their lead with a 2 in the third but with DAFS front end now finding their weight, the 4th end went their way with an excellent 3 and a steal of a single in the 5th brought the scores level. The 6th end saw Penicuik finding their way again with a single and we managed to protect a single in the last end to secure a 7 -5 shot victory. Shot of the game was and angled take out by Roger which he played superbly well despite being told by his team mates that it might be above his capability. It was noted that Penicuik front end had a combined age of around 160 years. There’s life in the old dogs yet. Our thanks to Graham and his team for joining us in a game played in the best of spirits. All involved enjoyed the evening. This entry was posted in Club, Social on January 19, 2019 by captainken45.